Harold and Lou talking about the pills. Luka telling Serena they can't have a relationship. Serena has snuck out of the house to see Luka. When they meet up, he tells her he isn't going to lie anymore: he wants to be with her, and he doesn't care what anyone else says. Serena tells him she feels the same. Luka warns that they should be careful, and that no one should know about it. This comes as a surprise to Serena, who thought that for once, she could have someone she wouldn't have to sneak around with. She starts to leave, but Luka stops her and explains that he should be on a plane home now, but he convinced his parents he's staying with some friends, just so he could buy some more time to spend with Serena. Serena changes her mind about him. While working on some costumes for the school play, Sky and Lana talk about the future of Enigma and Freak Girl, and how it could be turned into a movie. Lana says they could play themselves, but Sky says she'd rather have Johnny Depp play her. Lana doesn't understand. Sky changes the subject, and shows Lana some drawings that are going in the newspaper with Libby's article. Lana says that a friend of hers once got some stuff published – in a gay magazine. Lil tells David that she's feeling tired. David tells her to take things easy, she's overdoing it. They think her tiredness and eczema might be to do with Svetlanka's visit. David tells her to put her feet up and he'll finish making dinner. Lil complies, and when she goes into the lounge room, she again sees Harold's Function Rite. David wonders what would happen if you took Function Rite when you were already functioning right. “Would you function great?” Lil throws the pills to David and asks them to get them out of her sight, because every time she sees it she pictures Harold and Svetlanka. When she says this, David can't help but feel a little sick himself, and he handles the box of pills with a set of tongs. Harold and Svetlanka have their dinner in the pub. 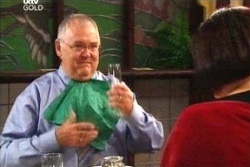 Harold gets Svetlanka another glass of champagne and a glass of water for himself, so he can take his “medication”. He pulls the box out of his pocket, only to discover he has the wrong ones. He asks Lou to go get them, because he has to take them two hours before he engages in unmentionable acts with Svetlanka. He begs Lou to get them, because Svetlanka has that glint in her eye, and he needs all the help he can get. 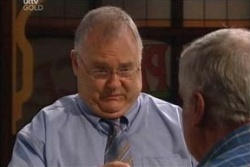 Lou tells Harold he can't leave the pub, and suggests he calls David. Harold is horrified at the thought. “Oh yeah,” says Lou. “Probably not a family matter, is it?” He offers to drive around, and borrows Harold's keys to get in. Lana tells Sky she gives up, and asks why she would want Johnny Depp to play her in the film. Sky tells her it because all good actors need to research their roles, and what better than to have Johnny and Freak Girl one-on-one? Talk turns to Lana going out with Brendan. Sky asks her why she went out with him when she didn't really like him. Lana explains that it was easier to fit in that way. Sky reveals that she knows the details of Lana's old school life. Lana is shocked, and accidentally stabs herself with the needle. Sky takes her hand and kisses it, saying Freak Girl has the power to heal. Susan walks in and is pleased to see them getting along. She offers buy them a cup of coffee, with a possibility of chocolate cake. Luka reveals his hideout to Serena. Serena says that it does have a certain appeal. 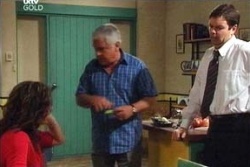 Luka tells her it did for someone else too, and shows her a picture he found, of previous Ramsay Street residents Billy and Anne. Of course, Serena and Luka don't know who they are. Luka reveals a little piece from his past. At his old school he had a really bad relationship with a teacher, and he stole his briefcase and set fire to it. The teacher was supposed to find it all charred the next day, but the fire got out of control, and the whole school burnt down. Svetlanka was the only person he could go to. She gave him an alibi, so he owes her big time. Luka asks if Serena still wants to see him, and Serena reassures him that she does. David and Lil are about to sit down to dinner when there's a knock at the door. David opens it and Lou is surprised that there is someone home. Lou comes into the kitchen and looks around, trying not to be obvious. He explains that Harold forgot something, but can't bring himself to say what he forgot. Suddenly, Lil and David realise what he wanted, and give him the pills, disgusted. Lou apologises, saying he didn't want to do it, and the three of them agree to never speak of it again. Susan has told Sky and Lana that she is going back to Susan Smith. She's not changing her name so much as reclaiming it. Libby comes over and shows Sky her first published drawing. They all tell her it's great. Libby and Susan leave, and Lana tells Sky she should as well. Sky asks her to sleep over at her place, and bribes her with an old movie. David and Lil's dinner is again interrupted by Lou. Harold's car won't start, and he asks David if he can drop him round to make the delivery. A very disgusted David tells him no, because he and Lil are trying to eat and it's very bad for the digestion. Lou talks him into lending him his car, and Harold leaves. Lil and David decide to skip dinner. Susan and Libby get ready for their book club. Apparently Lyn's out, so there's more cake for them. Susan tells Libby about a job opening at the high school for a media studies teacher. Libby doesn't want it, because of the Taj incident. She wants to go back to teaching, but not at Erinsborough High. Lou enters the Lobby to find Harold, in a robe, talking to the receptionist. Lou gives him the pills, and Harold is about to say something to him when he is interrupted by Svetlanka calling to him from the spa room. He asks the front desk to charge some items he is holding to Svetlanka's hotel room. The items are a bottle of champagne and a can of whipped cream. Harold starts off towards the spa, and Lou asks him about the pills. Harold tells him he doesn't need them anymore. Lou notices the hotel staff looking at him holding the pills, and he leaves. Serena comes home, and Lil tells her off for coming home so late on a school night. Because Lil and David are under the impression that she was studying with friends, Lil just tells her to keep an eye on the time in future. Lil goes off to the book club, and Sky says it's just a cover for a girly gossip section. David doesn't think so until Sky points out that she took a bottle of brandy and forgot her book. When David leaves the room, Serena talks about her night with Luka. She loved the whole night. Sky and Lana try to get Serena to reveal whether or not they went to “the next level”, and Serena tells them that they didn't, but she's quite sure Luka's the one. Susan keeps trying to get Libby to take the job, with no luck. Susan tells her she's paid for her mistake, and no one's punished her more than Libby herself; it's time to move on. Lil comes in, and notices something was going on. She shows them the drink she's brought. Susan gets some glasses, and Lil tries to get Libby to tell her what the problem is. Sky tells Serena she doesn't understand why she and Luka should have to sneak around if it's all so real and open. Lana, however, agrees with Serena. If sneaking around is the only way to be happy, then so be it. It's no one's business but their's anyway. Serena declines the offer of joining in watching the movies with Sky and Lana and says she'll have an early night. Sky asks Lana which movie she wants to watch first, and Lana picks “Adam's Rib”. “So you are a soppy romantic after all,” Sky says, touching her arm in a way that might be misinterpreted. Lil offers her opinions in the matter of Libby going back to teaching. Lil can't believe she's even contemplating it. If it were her, she wouldn't be able to show her face in public again. She goes on for a bit, then suddenly has to run off to the bathroom – too much brandy. Susan tells Libby not to take what Lil said to heart, and to blame it on the brandy. Libby tells Susan, very decisively, that she has decided to take the job, and she'll walk into the school with her head held high. Sky lends Lana a set of pyjamas to sleep in, but Lana tells her she's fine in her uniform. Sky starts getting changed in the lounge room, and Lana can't help looking. Lana puts on a movie to distract herself from it. Later on, thinking Lana is asleep, Sky tries to get the remote from her so they can watch something else. Lana busts her, and they play-wrestle on the couch, which suddenly ends when Lana kisses Sky, much to Sky's surprise.